Bed-Stuy Pride. We came. We Celebrated. From the incredible performances by cultural workers and artists alike to the amazingly supportive small business and organization vendors the 3rd Annual Bed-Stuy Pride was jam packed with beauty. I am so grateful to be surrounded by such a hard-working community dedicated to challenging homophobic and transphobic violence [all while lookin Brooklyn fly]. As I unpack boxes in the Brooklyn office I’m reminded of some of my favorite moments of the day. .. Thank YOU for an amazing 9th Annual Trans Day of Action! TransJustice and the Audre Lorde Project would like to thank you for making this year’s Trans Day of Action a fabulous success! Read more about Thank YOU for an amazing 9th Annual Trans Day of Action! Please help the 3rd Space Health and Wellness Collective begin to support our communities’ health by answering this anonymous short survey. Thank you! Ever wonder about your safety? Live or work in Central Brooklyn? Wanna learn concrete tools to address homophobic and transphobic violence in your neighborhood? 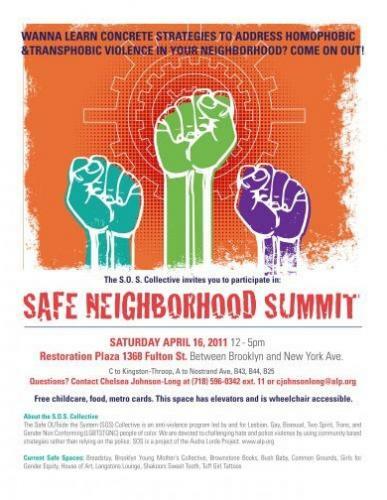 Registration is now open for the 3rd Annual Safe Neighborhood Summit. April 16 from 12PM - 5PM. Introducing ALP's newest program 3rd Space Support! After much visioning, input from our community and work the Audre Lorde Project (ALP) is proud to announce the launch of its newest program, 3rd Space Support. The 3rd Space Support program is excited to launch its first events! How can I get involved with the 3rd Space Support program? Read more about Introducing ALP&#039;s newest program 3rd Space Support! The Audre Lorde Project will be closed from Wednesday, December 22nd to Sunday, January 2nd, reopening on Monday, January 3rd.